So, I was given the opportunity to paint this Motorcycle for a wonderful couple. They came to the office, saw the ice chest I painted to look like you could see inside it. The decision was made. Convert the candy apple red factory paint to this theme. 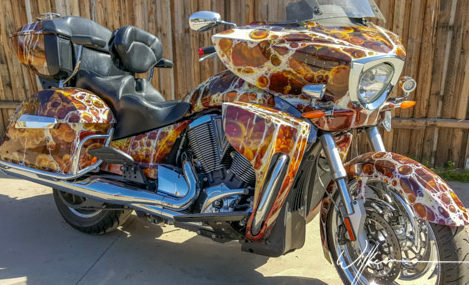 I must say, I have never seen or painted, in the many years of doing this, anything like this on a motorcycle. the results – amazing.